A majority, around two in three (63%) of voters in Sydney support the city hosting World Youth Day in July with several hundred thousand young Catholics celebrating the Pope’s visit. Most supporters are happy for the event to occur even though it will involve road closures and disruptions to traffic. Nonetheless, such events (as was the case with APEC) do run a risk of alienating a substantial minority. Research suggest that four in ten (40%) oppose any event that causes disruptions to the public. Do they hold the same view about New Year’s Eve fireworks? What about visits by the big ocean liners? Whether or not to hold events that might cause disruptions is a judgment that politicians have to make. It seems to be OK to most people for us to host an event like World Youth Day for Catholics. For Anglicans too? What about more minority religious groups that make up the complex fabric of our richly multi-cultural population? Would we generally be as supportive? This is not something that can easily be measured by polling as it raises a potentially contentious issue. Perhaps we will do a post-Youth Day poll and see if really affected anyone in any negative sense. How many noticed it? What did they do? 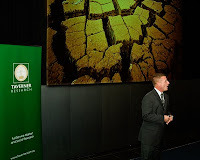 On the evening of 1st April Taverner Research hosted a thought-provoking evening at the Museum of Sydney where over 130 staff, clients and friends listened to Randall Pearce deliver an updated presentation based on Al Gore’s Oscar-winning documentary ‘An Inconvenient Truth’. We extend our thanks to Randall for his time and enthusiasm, and to all our guests for making it such an enjoyable evening – yes, post session drinks and food was served with most guest staying on for quite a while. We also compliment the Museum of Sydney on providing a great place to hold such an event. We hope to be able to provice video in the near future, but for now a selection of photos from the evening can be viewed here. Randall delivers ‘Facing an Inconvenient Truth’ presentations at no cost for his time through his commitment as to the ACF / Al Gore’s Climate Project. Anyone interested in hosting a similar event can contact Taverner Research on 9212 2900. What timing! The Taverner Poll announced on Sunday in the Sun-Herald and Sunday Age that 87% of the voting public (non-voters too) would support a woman as our Governor General – a view held by 89% of women and a high 84% of males. This positive finding must have been very good news indeed for Kevin Rudd who we knew was keen to appoint a woman for our next Governor General. No doubt it would please Julia Gillard too. Directly after our PM return from his exhausting 17 day trek around the world, where he got to know and express his views to many of the world leaders (controversial or not), we read that Quentin Bryce will take over the vice-regal position in Canberra in August (replacing Major General Michael Jeffries). Even we hadn’t realized quite how abruptly the decision would be announced – the very next day in fact! Our GG in waiting is a passionate Queenslander, like Kevin Rudd. We wish her and her family all the very best. Another win for the biggest state! But a question……given Mr. Rudd’s comment about the Republic being a topic for later in the year, what is his expected time frame? The Republic word has suddenly come back in focus, following Mr Rudd’s off the cuff comment in the UK that it could be on the debate agenda later in the year. This week’s Taverner Poll (in the Sun Herald and Sunday Age 13 April) reports just under half (49%) of voters across NSW and Victoria are in favour of becoming a Republic and a large 42% are still against it. This shows very little change in Australian’s sentiment on the subject and certainly implies that a republic movement would still find it a hard task to achieve. The Taverner Poll however reinforces the view that the biggest barrier to us becoming a Republic (under whatever format is most palatable to all of the vested interest groups) is respect for our Queen. When it was suggested to the voters interviewed last week that a republic movement could occur when the Queen’s reign is over, close to seven in ten show support. Only 27% were emphatic that we should stay a Monarchy. Even among some one in three who want the Republic status at some time, around a third of them would rather wait for until the end of her reign. Taverner Research will run further polls to examine this issue as it evolves. A Taverner Research poll published in the Sun Herald and Sunday Age (Sunday 13 April) found that two thirds of voters (68%) across NSW and Victoria want our athletes at the Olympic Games in Beijing, despite recent revelations about China’s actions over human rights in Tibet and elsewhere. Slightly fewer (55%), though still a majority, say that it is appropriate for our Prime Minister, Kevin Rudd, to be present at the Opening Ceremony. On the other hand, a sizeable minority (33%) want him to stay away. Despite general support for us to remain involved in the Beijing Olympics, there is widespread belief that we, as a country, should make a formal protest. The poll found that 66% support it. This finding is positive reinforcement to the criticism of China’s actions that Mr. Rudd publicly expressed in China during his visit there last week. Only one in five voters (21%) say we should not formalize a protest. The Taverner Poll says to Mr. Rudd that his country supports stronger diplomatic actions against China by our government.